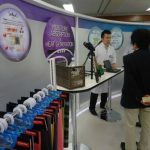 The Japan Textile Evaluation Technology Council (JTETC) is actively promoting the functionality-certifying SEK Mark outside Japan. Last year, the council had its Fresh Fiber booklet describing the SEK Mark and products distributed at ITMA ASIA+CITME in Shanghai, and it also had a booth at the Vietnam International Textile & Garment Industry Exhibition in Ho Chi Minh, at which the SEK Mark received very good response. This year, JTETC will have the Fresh Fiber booklet distributed at a textile exhibition in Europe, and plans to participate in exhibitions such as in Indonesia. The Exlan Operating Department (EOD) of Toyobo Co., Ltd. manufactures and markets high-performance fibers such as acrylate staple fiber and special acrylic staple fiber. In the Toyobo Group, Japan Exlan Co., Ltd. is responsible for the production of these acrylate and special acrylic staple fibers, and with such differentiated materials, it is developing markets in the U.S. and Europe, as well as placing an emphasis on sales to overseas sportswear companies. As part of these activities, it has been exhibiting in ISPO Munich, which is the world’s largest sports exhibition, since 2016. 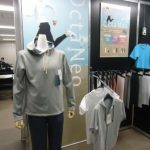 Japanese synthetic fiber producers position sportswear as a priority area where the functionality of synthetic fibers can be put to good use. Even for the spring/summer 2018 season, the producers are aggressively developing and presenting new fabrics.